Don’t check email the first hour of your day. When you do check it, have an intention for how long and what must be accomplished. The inbox is nothing but a convenient organizing system of other people’s agendas. So, beware jumping into the sinkhole that is your inbox during the first hours of the day – it can only lead to a reactive life. Instead, stretch or workout, think, eat well, then sit down and plan your day as if your time were as valuable … because it is. Don’t look at tv, social media or email 90 minutes before bedtime. Walk outside 30-45 minutes per day without your phone. Take several “digital diet” days per month, where you don’t look at anything digital whatsoever. Don’t look at your phone during meals or when interacting with – gasp – a human. This is a video that could potentially change your life and the lives of your families – and there’s nothing for sale here. This is about getting back to your humanity. It’s about disconnecting at the right times in the right ways from all the technology, social media and the insanity that has completely taken over people’s lives. You know how this goes. You go into a restaurant nowadays and you see two people sitting there and they’re not even talking to each other; they’re on their devices. You go to talk to people and they can’t even sustain 30 seconds of conversation without getting on their electronics. They’re completely jacked up. It’s taking over their heads. They can’t actually operate as humans throughout the day without their mind going crazy and spastic, ADD because they’re so used to checking in. People have become addicted to their devices, their technology and tools in such a way that it is stripping away their humanity. I don’t mean to be a doomsayer about that because I love technology. I think it’s the greatest tool ever. You and I couldn’t be having this conversation if it wasn’t for the technology. I appreciate it and love it. I love that maybe you stumbled upon this video or that someone shared it with you. I appreciate social media and email. I’m not one of those guys that says go live in a hut in the woods away from humanity, but what I am about is aliveness. What I am about is having control over your life and not becoming one of those minions who are completely addicted to their social media and can’t get away with it, or those who are losing entire days to browser blackout… They went to go work on something but then they clicked on one blue link and one link here and they tapped or swiped over here and four hours goes by and they’re like, “What happened to me?” All of a sudden their day is gone and they don’t know what happened. They can’t remember what they’ve done, what they’ve seen, or what they’ve accomplished, if anything. They’re like what, what happened, why am I naked? It’s like the day is gone! We have to get your day back. Five simple things not only to get your day back but to get your life back amidst all the distraction that is ripping you from the magic of the moment from your relationships and frankly, from your ability to really achieve things that are significant. We have to get our day back. Let’s talk about unplugging for a moment and what that can mean in the modern world while we’re still maintaining what we must if we have to as far as business, email or social media. First simple thing, all I want you to do, it will change your life completely. By science it is proven that it will increase your productivity by over 30% every week. It will also give you at least a minimum of two and a half to three hours more sleep each and every single week. How simple is this: All you need to do when you first wake up in the morning, the first hour that you are alive, alert and awake – you do not check in. You do not check your email. You do not do your social media or look at social media. You do not even check your voicemail or text unless you’re in an emergency situation or a customer service situation where that’s your job. Generally, you should not, in that first hour, look at anything that’s even digital. You don’t need to. If you’re like, “Brendon you don’t understand in my life I need to.” If you need to do this, and you’re ruled by this [checking-in], then you have not designed your life that intelligently. It’s not to be flippant. It’s not to be rude. It’s not to be directed with people. It’s to say look, if this is taking over your life in a way that you can’t give yourself an hour in the morning, then you’ve become addicted to a machine. You’ve become addicted to something that is controlling you. Why is the world controlling your first hour? You should control your first hour and here’s what we’ve proven in high performance. If you ever study my work with High Performance Academy or my book The Charge or all the work I do in High Performance coaching. I’ve trained more High Performance coaches than anybody on the planet. We certify High Performance coaches and some of that work came from some famous studies and work that I’ve done, and one was very simple. If in the first hour, instead of checking anything, email specifically, they just sat down with a piece of paper and wrote, “What is it that I’m working on right now? What are the major projects and the four or five things I need to accomplish on these projects? Who are the people I need to reach out to today or that I’m waiting on that I need to reach out to today to get a decision to move something forward? What are my key priorities that must happen today, the top three/five things that must be done no matter what, today? What steps could I take to move my dreams forward today? Those questions of being more intentional with your day versus reactive, that’s why we need to get you away from checking in right off the bat. The second component to this is not checking in at all in the last hour of your day either. People are literally laying in bed waiting to go to bed looking at Twitter and they can’t figure out why they aren’t getting a good night’s sleep. They’re a wreck. They’re busted and every morning they look 50 years older than they should look. Because they’re firing off neuropathways, neuro hormones in their brain right before going to bed and they can’t get a good night’s rest even if they fall asleep fast. Throughout the night their sleep is less restful because what they’ve done is activated all these hormones and processes in their brain that these things give you. What ends up happening is that all the things you see, that variety of posts. Every new post you see you should think, “Every new post I see, a new drop of dopamine falls into my brain.” The more dopamine the more activity and reward centers that that are alive, which is an enlivening process which is why everyone gets so addicted to it. Looking at our posts is like cocaine today for the brain, so what we have to do in that last hour is, don’t look at it. Just go on a digital diet in that last hour of your day and that first hour of your day. If you do that for 30 days, I guarantee if you come back to this video you’ll post and be like this just changed my life – that one thing you told me completely changed my life and I know it will, so please do that. The second thing to help maintain this digital diet concept and help you unplug more often is to do this: Make sure, make absolutely sure when you’re in a human interaction with somebody that you force yourself not to look at this [your phone]. If you’re at dinner with somebody, turn it off. If you’re in a conversation on the street with somebody don’t look at it. Do not be in a human conversation and keep looking at your device, because it’s stealing that relationship magic that happens for people, that creative engagement, the joy, the love, the connection between people. When you’re with a human don’t look at it, unless you say hold on I need to check this right now because something is going on. Sometimes in our lives there is a big deadline or there is somebody in town visiting us or we do need to be available and sure, we can let a person know about that, but let that happen at the beginning or at the end. But allow this time in a relationship to be real. And if you’re married or in a relationship and you’re trying to deepen that relationship or reconnect it, do not look at all; I highly urge you. In the last four or five dinners you went to with somebody, did you have to look at the phone during dinner? If you did then you’ve started losing humanity. It’s like the worst thing. If you can’t even have a meal without looking at your phone than you’ve really lost touch with the magic of human interaction. I don’t do that as a judgmental person, I do that because studies continue to show that the more interruptions people have in their conversations and the more interruptions they have in their times to create, connect, to give, to work together and to love together then suddenly what ends up happening is there’s a disconnect, a self report on both sides saying they aren’t feeling each other. That’s happening because they’re lost in the abyss of the digital stream.Take that time to make sure if you’re in a human interaction relationship that you don’t look at it unless you’re working on something specifically then, but that doesn’t count usually at lunches, dinners, break conversations with people. The third thing, if you want to go another step further and be totally crazy, totally off the wall, make sure you setup days where you never look at it at all. There are days, despite the fact that I have millions of followers online, where I literally don’t even look at it. I won’t even log in, because what I’ll do is schedule out my posts on Facebook or Twitter or I’ll schedule in advance with everything else I have to do or I’ll delegate it. I’ll make sure no matter what there has to be days off. If there isn’t at least several days a month where you’re not connected at all then I think you’ve probably gotten further away from what might be the experienced life. So I challenge you: Can you have a few days a month where you’re just off the grid totally, I mean completely that day? It feels like we can’t do that because the world would fall apart. It doesn’t. You know what you do? The more you go days without consuming it, days without being under the control of it, days without checking into it, the more you realize nothing happens. The world doesn’t fall apart. Nobody cares. It’s not a big challenge. Nothing is bad. Then everyone knows you won’t be immediately replying to them. Very few people in my life get the same day response from me. Does that make me a jerk? No. It makes me intentional about living a real life. Another two quick things you can do. One, every single week I challenge you for 30 days to get a book, a real book that has a cover on the front and the back and opens – it doesn’t turn on. Get a book, go to a coffee shop for a minimum of an hour with no phone or laptop, no digital. Just get the book, go to the coffee shop, get some tea or coffee or water and sit there and notice people and read your book. That’s all your job is. Reconnect with the art and humanity of life again, completely devoid of any digital distractions. Give yourself an hour a week for 30 days. 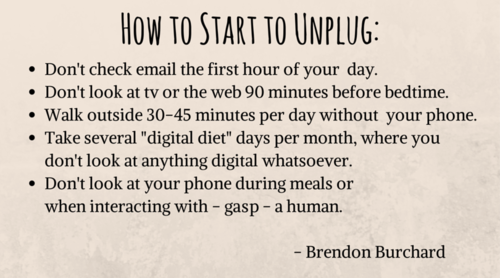 Last, to unplugging, make sure that several times a month you get outside. Many people don’t know this about me, but I take a walk every day, usually 30-45 minutes just strolling around. I’m out looking at things with no phone, without any agenda, and without even destination points – just to go for a stroll and look around. People are like sure you can do that Brendon, because you have free time or whatever, but I’ve been doing that most of my life. Just get outside. If you can go to the woods or be outside near the ocean or just in the open air in a beautiful vista, do that. Otherwise, if you’re living in a concrete jungle, walk around where it’s safe and go out for a stroll somewhere, because I think you’ll reconnect with yourself. You’ll have thoughts that you haven’t had for a long time. It’s very difficult to have deep, important, meaningful, artistic or creative thoughts if you’re constantly bombarded with interruptions and distractions that this thing [a phone] brings every time it chimes or buzzes at you. I hope that helps you. I think you deserve to have a life that’s a little less plugged in and a little less addictive, because when you do that a little more joy comes into your life, a little more energy and you feel a little more engaged with your days now and really in the moment. Presence comes back to you and suddenly you start feeling what we call… The Charged Life.